The Reverend Horton Heat is a rockabilly icon, but it wasn’t always that way. The guy kicked around in a few bands before starting a solo career some 25 years ago. Now, he’s so well-recognized as the Reverend Horton Heat that few people even know him by his given name, Jim Heath. The band recently marked its anniversary with the release of the DVD 25 to Life. We talked to Heath for a much shorter feature for a weekly paper. Here’s much more of our conversation. What’s a typical day like for you when you’re not on the road? I am a tax compiler. Well, if you are a small business owner, rather than spending your time figuring out a better microchip for cell phones or a better way to cut lawns, you’re now relegated to spending your days working for the man. You don’t get to play guitar if that’s what your business is. You just get to be a tax compiler. I got into all this because I was a slacker kid who spent too much time playing guitar. Now that I can sit around all of the time playing guitar instead of having a regular job, I sit at my desk for hours and hours. It’s a bunch of BS. I’m interested in trying to get a bit of a home studio together because it’s so accessible to do some stuff on my own. I wish I had more time for all that. You just released 25 to Life. Talk about the show and why it’s the one that ended up as a concert DVD/live album. That’s a hard thing because for those types of productions, we can’t go around for a whole month and hire the best camera guys and have a mobile audio truck. That’s a big production and it’s really scary because when that night hits, you better be on. I can do the simple stuff like make sure I’m not falling over drunk but the hard stuff is the singing. It’s one of the hardest things in music. Your voice can go out and that would be crappy for me. I can reliably play guitar. But it all worked out pretty good and came together pretty well. It’s a neat looking venue. Is this tour designed to promote that release? We tour for the sake of touring. We tour regardless of any album release. My art form is playing music . . . Music is about the crowd and the moment. That’s what we do. We play a lot of shows. When you began playing in 1985, did you ever think your career would last this long? Well, I wasn’t thinking too much about how long it would last. When you first start out, the question is whether you will have a career at all. What really got me into this ’50s rockabilly thing to begin with was that I got interested in the ’50s blues. I was a regular kid going to buy a Black Sabbath or Alice Cooper album. I went to the mom-and-pop store and the guy had this giant blues display. I was listening to this music thinking it was really edgy. Howlin’ Wolf had this scary kind of voice. Then there was Sonny Boy Williamson and also Buddy Guy’s guitar playing. It made me start reading about it and listening to it. It made me realize that the career artist concept as opposed to the one-hit wonder. There were long years of playing in not-so-smart bands. It was way cooler to be someone like B.B. King or Willie Nelson who played music and had a great career without having giant hit records. Were you a soundman prior to becoming a working musician? Well, no. It’s kind of a long story. I had been in bands and had a half-baked PA system so I would rent it out to make extra money and that led me into my career with Rev. 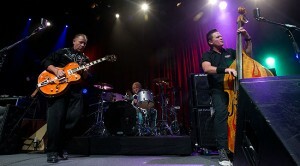 Horton Heat. I started renting my PA to this one place and then I was there three nights a week setting up shows. I would load the bands in and then run sound if they didn’t have their own soundman. That was a precursor, but I was also playing in bands at the same time. Was it a Johnny Cash song that you did for the first time as the Reverend? Yeah, we put together this jam band at Theater Gallery. These musicians were from a bunch of different bands. Each guy got their chance to do a song, and I did “Folsom Prison Blues.” The owner of the club wanted me to do my own thing. For a while, I played solo. It was a godsend at the time. I was young and really too young to be a divorced dad. I was working all sorts of different jobs and with different bands to make ends meet. Within the first three or four or five gigs of being a solo guy, I was making enough money that I could hire band guys. That led to a full year of me paying them more than I got paid. A lot of times I could pay them and not me. Instead of side guys, I had serious players and a real cohesive band. I wish I had more time. I have several different ideas and concepts going on and I do have a lot of songs built up. If I had the time to whittle them down, I will. I have a song idea and then I’ll write the lyrics and have a chord change in mind, but the hard work is that each one has to be whittled and refined to make it a real song. The inspiration comes and that gets you out of the blue. The hard part is finishing it. I have done it before and I will take a two-week period and go everyday to a cheap demo studio and rent it out for two weeks and that forces me to go there everyday and make demos of these songs. Next thing you know, we have enough songs for an album. Why does your music end up on so many soundtracks? I don’t know. I’m flattered that it has. If I could bottle that, I would. That’s our way of having a hit song. I have some stuff that is somewhat spaghetti Western-ish and influenced by Ennio Morricone and there’s a Henry Mancini thing a little bit. I have some people who want me to write some stuff specifically for their shows. I haven’t done too much of that. I have done a few things like that. Songwriting is a funny thing. It scares you. It’s like, “I have to come up with some music and it has to be a spaghetti Western meets a space alien type of thing. That’s scary.” I will start plunking along on my guitar and realize I’m just playing the same lick I always play. If I stay with it, it’s like magic and something comes out. It almost scares me. It’s like it comes from outer space. That’s the real beauty of musical composition. One moment you’re fearful and the next minute you just found something that is really special and cool.